Water Dog Lake Park in Belmont is one of those rarities: An urban park that provides a surprisingly high amount of surprisingly fun singletrack trails for mountain bikers. On top of that, many trails at Water Dog are actually challenging enough to satisfy intermediate and advanced riders as well. (Another surprise!) How many more places can you name, about which the same can be said? And, while the total trail lengths don't exactly add up to an epic amount, if you don't mind a few repeated loops and traversing the same trails in opposite directions here and there, you can string together rides of very satisfying scale in just this little "neighborhood park". The trails at Water Dog make up a tight mesh. So, there are infinitely many route variations that are possible. This particular ride simply happens to be one of them, without much that is special enough to set it apart from any other ride you can do at Water Dog. The ride starts out the way I've become accustomed to riding at Water Dog, by entering the park from the trailhead on Lyall Way. What comes first is a very gradual fire road climb. After a sharp left at the crease of the ravine, a series of steeper fire road drops and climbs come next. 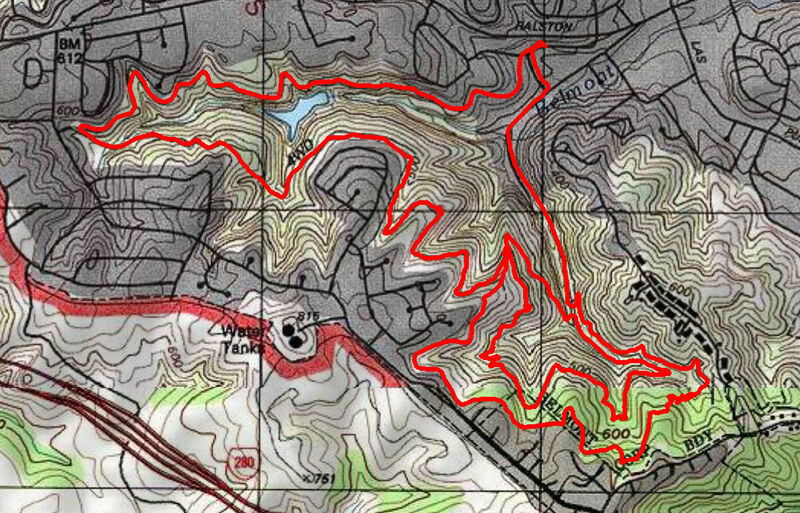 Then the route enters the "main" network of singletrack trails of the park, in its southeastern half. This particular route descends all the way to the trailhead at the end of Carlmont Drive before turning around and continuing back into the singletrack maze. That is followed by skirting right at the edge of the residences on the park's boundary along Finch Trail. One of the more distinctive features of the park comes after that: A long series of steep and very tight switchbacks. Following this particular route, you'll be descending these. I can probably say that I actually prefer the challenge of climbing these switchbacks even more than descending them. Depending on how you count, there are at least 15 switchbacks in this segment. The route then takes you back to the starting point over paved streets. That's by no means an especially recommended return route. If you feel you still have the energy, you'd have more fun returning back through the maze of trails, either all the way over via Lake Road Trail (the initial fire road climb) or by shortcutting that a little via Berry Trail.